Our church community originates in the first instance with our founder, Jesus Christ, who is the Head of the Church and we, the community, are His Body. “love the Lord thy God with all thy heart, with all thy soul, and with all thy mind.. and love thy neighbour as thyself”. With these in mind the following briefly outlines the early growth of our Parish from circa 1849 to 1914. The Henty Brothers, pastoralists grazing sheep, were the first English settlers in the colony of Victoria. They arrived in 1834 at Portland with their workers and merino sheep, bred from the King’s flock. The Henty family held regular Anglican services in the woolshed. The first organ used at Portland is now in the Cathedral at Wangaratta. The Henty’s were followed closely by John Batman, who entered Port Phillip Heads on 29th May 1835. He and others developed sufficient infrastructure so that the Rt Rev Bishop Charles Perry was able to settle in Melbourne in 1848. There was only one Diocese at that time, covering the whole of Victoria. The Parish of Kilmore was the fourth to be established after Portland, Melbourne and Geelong. It was the first inland Anglican Parish in Victoria. The Reverend William Jones Thomas Singleton, M.A., a sincere and dedicated Christian from Ireland was invited to come to Kilmore as first Rector. He arrived in 1849 together with “his excellent wife, Frances” and a large family of children. He conducted his first service on 24th January, 1850 in the school house which also served as a chapel. The land had been donated by the Crown. 17th February, 1850. Rev Singleton opened the first school in Kilmore in the purpose-built School House building. Riding on horseback, communion services were held regularly at outlying homesteads. Victoria was made a separate colony from New South Wales in 1851. In the same year, gold was discovered and prospectors from many countries flocked to our districts. Many of these immigrants were married, buried and baptised by our early rectors. On 19th November, 1857, the first stone of Christ Church, Kilmore was laid by Bishop Charles Perry. 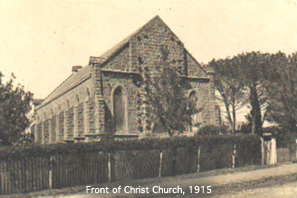 By January 1861 the first service was held in Christ Church, Kilmore. There had been 3 architects: Perrot, Kingk and Fleury in succession, but despite many set-backs Christ Church, Kilmore was completed (except for the Bell Tower) in 1864. The year 2007 will be the 150th Anniversary Year of the laying of the first foundation stone in our Parish. In the meantime Rev Singleton with some of his neighbours, had worked strenuously to build a church at Broadford. Bishop and Mrs Perry opened the new building on 3rd August, 1862 when St Matthew’s was dedicated by Bishop Perry. On 22nd May, 1867 Christ Church, Kilmore was also dedicated by Bishop Perry. (See Consecration Certificate in the Parish Archives). By 1870 a thriving Sunday School was operating at St Matthew’s, Broadford. In 1901 the Diocese of Wangaratta was created. On 26th March, 1914 the Church of the Transfiguration at Pyalong was dedicated: an earlier church had blown away, founding date unknown. The Church was dedicated by Rt Rev T. H. Armstrong, D.D. Bishop of Wangaratta. Rector: J. A. Peck. Humanity entered a “time of trial” when World War One broke out in July and August, 1914 . Many young people from the district volunteered, including 54 from the Anglican communities of Kilmore and Pyalong. (Numbers for Broadford and Tallarook are not to hand). Of the 23 from Pyalong, 2 died at Gallipolli and 1 was killed in action in France. Sister Mary Semple was the only woman recorded - a nursing sister. Tom Pearce, retired farmer from Glenaroua and High Camp, rode with the Australian Light Horse at Beersheba. He was buried at Kilmore Cemetery in 1984. He and his fellows from Gallipolli and France helped Australia form its identity with the Legend of the ANZACs. Christ Church Kilmore’s Honour Roll is inscribed on wooden panels behind the altar. Australia became short of manpower, including priests. From 1939 to 1949 Broadford and Tallarook could no longer remain independent. They were attached to Christ Church, Seymour. Again, they could not find a Rector from 1953 – 1958. Services for this period were held by the Venerable W. J. Chesterfield of Tungamah and many laymen, until in 1958 Rev Bartholomeuz was invited from Manchester, England. Under his leadership, St Matthew’s and St Stephen’s went from strength to strength: the young people were encouraged to join the Church Tennis Club, the elderly were provided with a Retirement Home; music flowed through the services. Meanwhile Christ Church Kilmore, under a succession of talented rectors, built a new rectory and opened The Anglican Op. Shop in the old rectory : two of many successful activities. From the 1960s, our Church communities felt at peace once more. Those parents of our “baby-boomers” in the sixties are now our senior citizens! In the new Millenium we have a new set of challenges with times of trial overseas. St Matthew’s and St Stephen’s amalgamated with the Parish of Kilmore and Pyalong on 15th May, 1994 under Rev Steven and Deacon Sandra Salmon. The name of the new Parish by general consent was “The Anglican Parish of Kilmore”. Compiled from Sources in the Anglican Parish of Kilmore Archives; the centenary booklets compiled by Jim Lowden, oral history transcript and from Rev Dr Colin Holden’s book “Church in a Landscape” 2002).